In honor of the anniversary of the Fab Five’s first number one US hit I’m reposting my recollection of attending their first show at MSG. On March 21st, 1984 I attended my very first concert. Duran Duran’s Sing Blue Silver tour arrived in New York City and sold out two nights at Madison Square. Despite my parents’ assumption that riots were guaranteed to break out at any and every rock show, I was able to score tickets and permission (in that order) to the concert. A few days before the show I found out that pop station Z-100 was going to broadcast the concert live. I immediately set up a plan that would enable me to relive this historic moment in pop history over and over again. I was able to convince my mom to agree to tape the show for me. This was a decision she would quickly regret. Step 3 – A few hours before the show call home and make sure Mom has retained her lesson. Also remind her that the benefit of listening to the show is the added peace of mind of knowing that the state police have not been called in to halt the Duran Duran riots. Step 4 – Get a friend to tape the show – just in case. I attended the show with my friend Diana. At the time we were friendly, but not the best of friends, but our mutual appreciation of Duran Duran set up a solid foundation. The exultant anticipation of walking into MSG to see a show for the first time is an experience you never forget. Getting from the street to your seat literally takes a lot of time and effort. First you have to make your way past the sketchiness of 34th street/Penn station. Then, relieved you haven’t been mugged or pick-pocketed, you walk through a cavernous under ground bunker into the lobby, through the ticket gate, and finally begin your ascent – up, up, up the escalators. And at MSG when you’ve only paid $12.00 for tickets you spend a lot of time going up the escalator. When Diana and I arrived at our seats we realized we were in the rafters but that didn’t temper our excitement. We ignored the opening band (the cool thing to do) , chatted with a couple of other concert goers and then . . .
An exact replica of the t-shirt I owned. I may need to buy a new one on ebay. Most of my friends found it hard to believe how much I liked the group. They understood why so many 9th grade girls liked the band – but why was I so enthralled? I’d argue, with 100% sincerity, that these guys had every right to be compared to the Beatles. 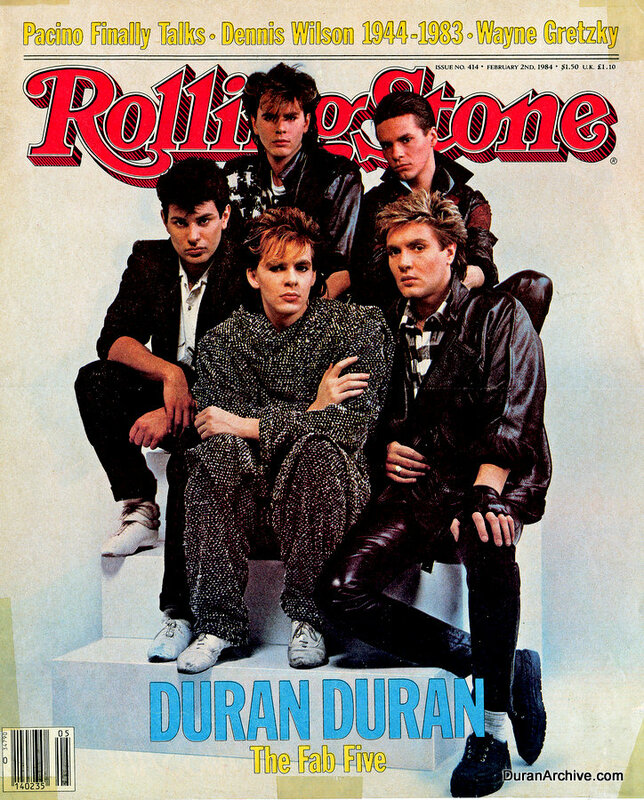 In truth – I did like Duran Duran’s music – it was catchy and fun and danceable. And when Nile Rodgers started working with them (The Reflex single remix, Wild Boys, Notorious) their music also became interesting. But I was also drawn to the image – the band’s look and their looks. I embraced the aforementioned Rolling Stone cover story because it a) gave the group some musical cred and b) gave me the chance to stare at those pretty, pretty faces. And in case you were wondering – here’s how they ranked (16 YO Sean and Sean of today have similar taste, although today I might swap Simon and Roger). 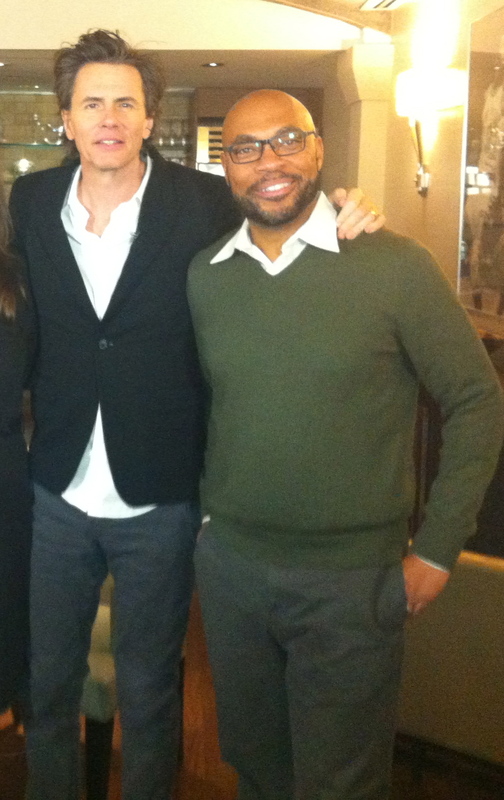 Last year while working at Fuse I met John Taylor – backstage at Madison Square Garden. It was a nice ‘full circle’ moment. I made a point to tell him that 29 years earlier he and his band mates had the honor of providing me with my first concert experience. I think I expected him to be a little surprised (there weren’t many boys at the show and the only other black people in the arena were the two back-up singers and Nile Rogers). But without a pause he thanked me for being a fan and remarked how quickly the time had passed. I guess when you were at one point the biggest band in the world you assume everyone was a fan. Apologies to the colleagues who I cut out of this shot – but this is a two man band. 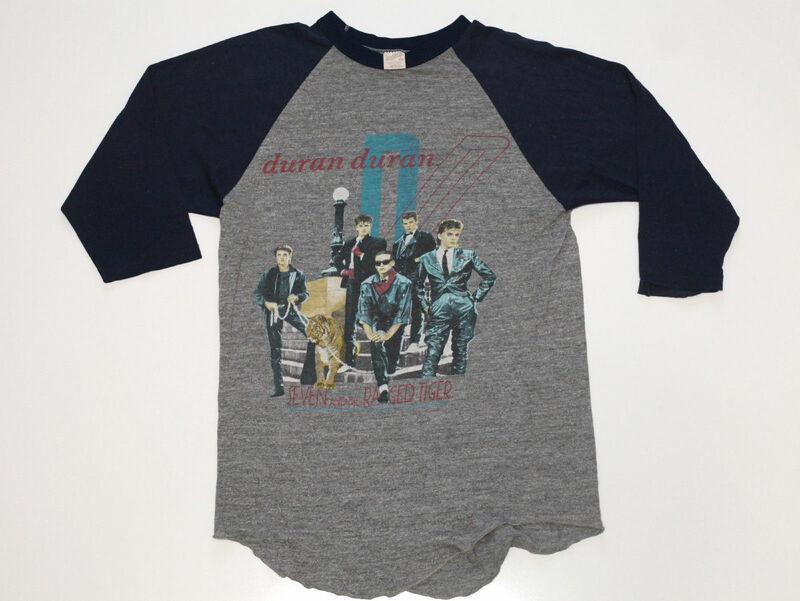 This entry was posted in Concerts and tagged 1980s, 1984, Culture, Duran Duran, first concert, John Taylor, Madison Square Garden, Music, Nile Rodgers, POP CULTURE, Pop Music, Roger Taylor, Simon LeBon, The Reflex on July 3, 2014 by Sean. love Please, please tell me now!